Lighting in modern buildings is more than a basic requirement – it can play an important role in the architectural design and the energy efficiency of the building, not to mention the health, safety and well being of the occupants. With an impressive spectrum of products for the control, measurement, regulation and automation of lighting, ABB i-bus® EIB / KNX can perform challenging lighting tasks. 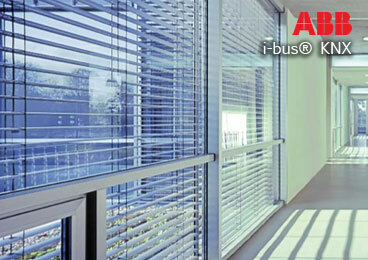 - evaluate the physical limitations to which a constant lighting control is subject. For this purpose it is necessary to understand the most important terms used in the field of lighting technology. How does constant lighting control function? In constant lighting control a light sensor installed on the ceiling measures the luminance of the surfaces in its detection range, e.g. the floor or the desks. This measured value (actual value) is compared with the predefined setpoint value, and the control value is adjusted so that the divergence between the setpoint and actual values is minimal. If it is brighter outside, the share of artificial lighting is reduced. If it is darker outside, the share of artificial lighting is increased. 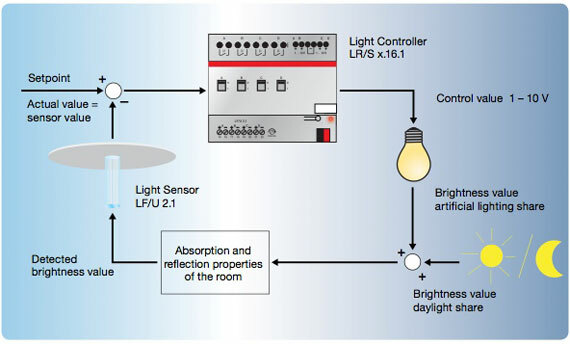 The exact function of the light controller is described in detail in the manual of the Light Controller LR/Sx.16.1. A Luxmeter placed underneath the light sensor, e.g. on a desk, is used for setting the setpoint. This Luxmeter detects the degree of illumination which illuminates the surfaces underneath the light sensor. The objective of a constant lighting control is to retain the set degree of illumination when a setpoint is set. To perfectly implement this objective, the light sensor should be placed exactly on the spot where the Luxmeter was placed to adjust the setpoint value, in order to also determine the degree of illumination. As this is not possible for practical reasons, the light sensor is generally mounted on the ceiling. This is a compromise. For the reference setting of the setpoint, a Luxmeter is used for measurement of the degree of illumination; however, the light controller primarily detects the luminance underneath the light sensor. In this way the light controller indirectly maintains a constant degree of illumination. If certain constraints are not observed with indirect measurement, it can mean that the constant lighting control will not function or not function as required. This is not a specific phenomenon just affecting our constant lighting control, but rather is the case for all constant lighting controls. What is the difference between degree of illumination and luminance? In order to fully appreciate the problems relating to indirect measurement, it is necessary to examine the most important terms used in lighting technology. Only the basic terms are explained and we will forego a more exact and detailed explanation or mathematical derivation of more complex terms, e.g. luminous intensity = luminous flux/steradian. A luminary, e.g. a fluorescent tube, converts electrical energy to light. The light rays emitted by a light source (luminous exitance) are referred to as a luminous flux. The unit is the Lumen [lm]. Luminaries convert the input energy to light at varying degrees of efficiency. In addition to the luminous flux there is the item luminous intensity, also referred to as the lumi- nous flux density. The luminous intensity is measured in Candelas [cd]. The Candela is a mea- surement unit for luminous intensity emitted by a light source in a particular direction. An exact definition will lead to a complex mathematical analysis, e.g. the explanation of a steradiant. Simplification: A luminous intensity of 1 cd corresponds to the measured degree of illumination of 1 lx at a distance of 1 m from the light source. The luminous flux emitted by the light source illuminates the surfaces that it meets. The intensity with which the surfaces are illuminated is referred to as the degree of illumination. The degree of illumination depends on the magnitude of the luminous flux and the size of the surfaces. In accordance with the above table, a 100 W incandescent lamp with 15 lm/W generates a maximum luminous flux of 1500 lm. If the entire luminous flux of the incandescent lamp is not emitted in a spherical manner into the room, but rather concentrated and distributed evenly on a surface of 1 m2, then the value for the degree of illumination at every point on the surface would be 1500 lx. The perceived brightness of an illuminated surface or a self-illuminating surface, e.g. an LCD monitor, is designated as the luminance. The unit of luminance is cd/m2. If white paper is subject to a degree of illumination of 500 lx, then the luminance is about 130 – 150 cd/m2. At the same degree of illumination, environmentally-friendly paper has a luminance of about 90 – 100 cd/m2. On what does the luminance measured by the light sensor respectively the measured value of the light sensor depend? The luminance “primarily” detected by the light sensor depends on different criteria. It depends on the degree of illumination which the surfaces in the detection range of the light sensor are illuminated. The higher the degree of illumination, the higher the luminance of the illuminated surfaces. The same applies for the reflectance of the surfaces. The higher the reflectance, the higher the luminance of the surfaces and thus the measured value of the sensor. The measured value of the sensor is the actual value used for lighting control. The installed height of the sensor also plays a role. If the light sensor was an ideal “luminance measurement device”, then the luminance which it measures would be indepen- dent of the installation height of the light sensor. As this is not the case, the measured value of the sensor decreases as the installation height increases. Lighting in modern buildings is more than a basic requirement – it can play an important role in the architectural design and the energy efficiency of the building, not to mention the health, safety and well being of the occupants….